Rhubarb is planted anytime between October and early March, depending on the weather. The large rhubarb crowns are lifted out of the ground and are split in to sets. Even today the splitting is done by hand. A tool about 60cm in length and with a half moon shaped blade is used. They are split so that each set has buds on it, this is why rhubarb sets are not a uniform shape. It is the buds that grow to form the rhubarb stalks. Splitting the crowns is very hard work. It is done during the coldest months of the year. The crowns are heavy to move and can be tough to split depending on the variety and the age of them. 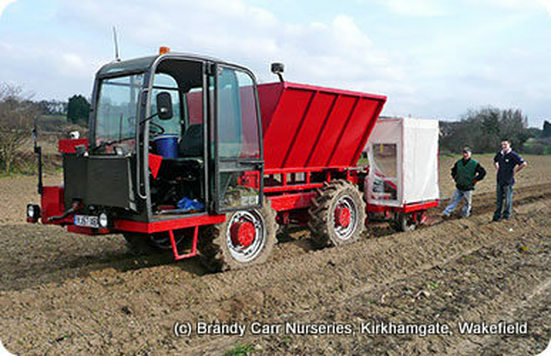 As the rhubarb will be in place for a number of years, it is important to prepare the ground. 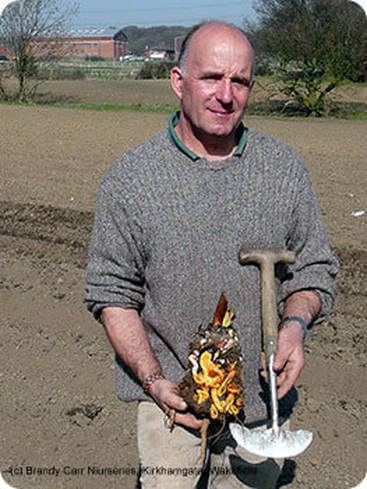 We use well-rotted manure or mustard as green manure to fertilise the ground. 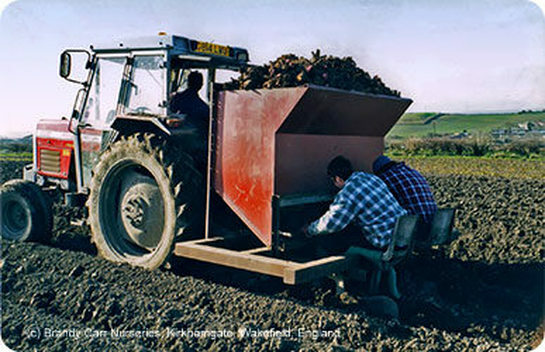 The soil is first ploughed deeply to incorporate the manure. Then we use a tractor-mounted rotovator to break up the ploughing. Another piece of machinery (commonly known as a ridger) makes the rows to plant the sets in to. Before tractors, horses were used to do the heavy work of ploughing and breaking up the ground. In the early 1900’s the sets were planted by hand. A man would make a hole, drop the set in and cover with soil. This was a labour intensive and time consuming job. 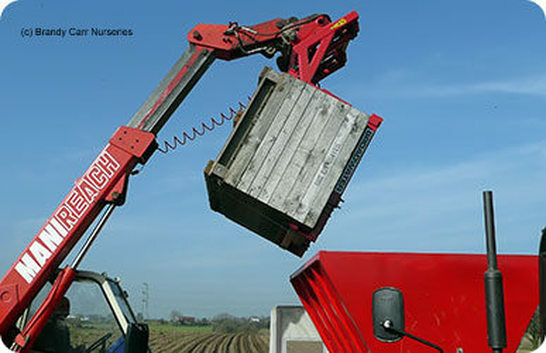 Rhubarb growers over time adapted other machinery to plant rhubarb, to make the job easier and quicker. Our old planter was designed to be used in conjunction with a tractor. One man would drive the tractor and two would sit on the planter to place the sets from the machine into the ground. The machine would then cover the sets. Our new rhubarb planter is a bespoke machine. It is designed to operate from the back as well as the cab. Two people can plant and operate the machine. Cameras are used so we can see where we are going and when we reach the headland of the field to turn around. The sets are tipped into the hopper on the planter, using the Manitou/teleporter to lift and tilt a wooden crate. The planter is then positioned in the rows, the rear of the machine is then lowered to prepare to plant. 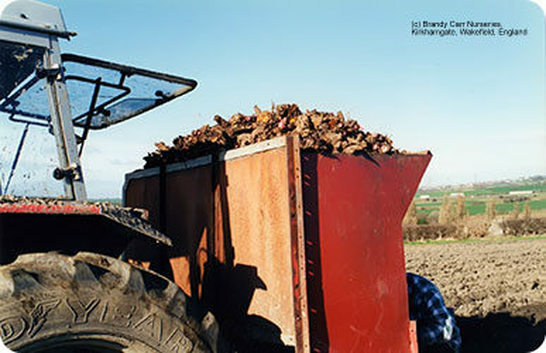 A rubber belt takes the rhubarb sets to a basket at the rear of the machine. The people plant the sets manually, by picking them out of the basket and placing them in to the furrow. The planter then covers these with soil. The planter has lights to enable us to plant in the dark. This is a major advantage with the short winter days. In Yorkshire rhubarb is grown on a 60″ bed system, which we operate on. The planting machine has been designed to adjust to work on a 72″ bed system. This makes it suitable for growers in other areas. It has the capability for 2 people to plant 12,000 rhubarb sets in an 8 hour day.